With the high rent prices and cost of living in the area, the search for the right apartment, condo, or neighborhood can be quite the ordeal—particularly if you have a pet. From pet restrictions and deposits to finding a place with ample space for Fido to play, the prices and factors to consider only seem to multiply. However, just because you have a furry best friend doesn’t mean that you deserve to compromise on your living situation! 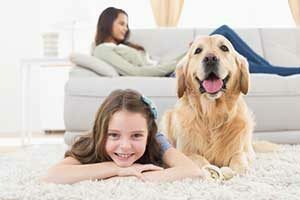 Contrary to popular belief, it’s possible to be both happy and comfortable in the area as a pet owner. This list of highly recommended pet-friendly accommodations will provide the perfect starting point for you as you look for a new home for yourself and your four-footed companion in Northern Virginia. The Prosperity Flats complex in Fairfax has 1 and 2-bedroom options available, starting at $1755 per month. The complex has a pool, all units are air conditioned, and is completely pet-friendly. All animals, including cats, small dogs and large dogs are welcome. The property is only a short distance from the Dunn Loring-Merrifield Metro station as well, making it a convenient place for the commuter who prefers public transit to call home. The property is well reviewed, with tenants frequently commenting on the helpfulness of the staff as well as the cleanliness of the property overall. Located on Federalist Way, Ellipse offers high end finishing and luxury styling while also catering to pet lovers. The high ceilings and modern design creates homes that anyone would be proud to show off. The pet policy allowing cats and dogs, ensures that pride doesn’t come at the cost of a good home for your pet. The facility also has a large fitness center equipped with all the latest equipment, a clubhouse, business center, and media lounge. Although a pet friendly location, they do have certain breed restrictions—so be sure to reach out to a representative about any questions you might have about your pets and the building’s policy. The Ridgewood by Windsor has apartments ranging from one to three bedrooms available to rent. These suites are in a highly walkable neighborhood with numerous businesses and amenities within an easy walk’s distance from the front door. The suites are all pet-friendly, but pet-deposits and increased rent fees are assessed for owners bringing a furry tenant along with them to their new home. The flat fees are $500 for dogs and $250 for cats, along with a $50 for dogs or $25 for cats monthly rental surcharge based on pet ownership. With one bedroom apartments starting at just $1,369, Devon at South Riding provides affordable pet friendly living without shorting you on comfort or luxury. There are fees involved in having pets here, but it is a pet friendly building. The deposit and monthly fees are the same here regardless of whether you have a cat or a dog. The deposit is $400, with the monthly surcharge of $40 added onto your rent each month as long as you have a pet in the building. Chantilly is home to more townhouse-condo developments than rental apartments that make a good fit for pet-owners. The Eastgage Condo community is an excellent example of a pet friendly environment that make the property a good choice for someone looking to buy into a condo in a pet friendly complex. For renters it can also pose opportunities, as units sometimes come up for rent by the owners who typically allow pets in accordance with the larger policy of the complex. The townhomes feature an attached garage and high-end finishings. Renting at the Julian means having everything that you need close to hand. Entertainment and shopping are close by thanks to the Fair Oaks Mall and Fairfax corner. Ample green space nearby makes for excellent dog-walking. Pricing starts at $1595 and pets are welcome. The Julian also makes an excellent home if you like to entertain. There are outdoor courtyards and pool areas which are ideal for welcoming guests to your home. The Elms has a wide range of suites ranging from 788 square foot one bedroom units all the way up to 2 bed, 2 bath 1148 square foot units. The Elms is a quiet complex that is tucked away from the hustle and bustle but which provides easy access to all the conveniences offered by big city living. Recent improvements to the property included the enlargement of parking spaces. The Elms is a pet-friendly community, although there is a 100 lb weight restriction on large dogs. They welcome a wide range of pets, and enforce a two-pet per unit maximum. Lakeside is an ideal community for dog lovers to call home. The units have all been completely refurbished, with brand new kitchens, large windows, and a balcony or patio with every unit. The complex is large, including three pools, a Starbucks, and best of all for pet owners, a dog park. As the name implies, sitting alongside the lakes makes for a perfect scenic backdrop when taking your pet for a walk. As a complex that includes a dog park, the units are highly populated with pet owners making for a friendly and welcoming community for those who have pets of their own. For pet owners working in the Capitol, The Palatine offers comfortable and luxurious accommodation on a short or long-term basis, while also allowing your pets a place to call home. The building is exquisitely finished, but for many, the appeal of the Palatine is its location. For people working in DC, Arlington, or Rosslyn, the Palatine offers convenient access to many of the most prominent employment hubs in the region. A Metro station (Courthouse) is also within a short walk of your front doors if you call the Palatine home. Pet fees apply, but there is no weight limit on dogs. Luxury is the focus of the high-end Crescent Falls Church complex in Arlington. Walk in closets, soaker tubs and granite cabinets are just a few of the highlights awaiting you in these exceptionally well-appointed suites. Crescent Falls Church is ideal for owners of small pets, as cats and small dogs are welcome. Some large dogs are admitted under the building’s policy, but there are several breed restrictions so it is best to check with the ownership before applying. Despite the bad rap it gets, Northern VA is actually quite the pet-friendly area—you’ve just got to know where to look! Our local communities embrace the idea of pet ownership, leading to a lot more buildings and management firms allowing pets in rental units. Some facilities take it a step further, actually providing amenities or features designed to cater to the pet-owning crowd. Sometimes when starting a new job or moving to a new area, things can get hectic and busy. When that happens, it can be nice to get a hand to make sure that your companion is well looked after. If you need assistance with your pet in the Northern VA region, contact Paw Pals any time. We offer pet sitting and dog walking services, so you can be sure your pets are well looked after even when you need to be on the road, are working late, or are taking a much-needed summer vacation. For more information, check out our About page or Meet our Team of pet lovers.